Your natural bone has the astounding ability to regenerate over time. However, there are certain situations where it may need a little extra assistance to accomplish this properly. 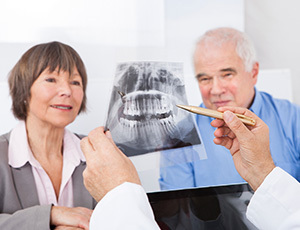 If you have lost a significant amount of your jawbone because of advanced periodontal disease, facial trauma, or ill-fitted dentures, the Premier Dental Care team can perform bone grafting to help you regain what was lost. This technique will encourage the growth of new, healthy tissue as well. We can create a healthy foundation for the placement of dental implants or a more aesthetically pleasing appearance for your smile. Whatever your personal situation is, consider exploring this option further here in Herndon, VA.
Where Does the New Bone Come From? The material we use can be sourced from several different areas. For instance, we could transfer bone from other parts of your jaw or general body; the chin or pelvis is usually a good candidate. This type of graft is known as an Autogenous bone graft. Alternatively, we could use synthetic material, which is created in a laboratory. This is known as an Allograft. Sinus Lifts – During this process, our doctors will elevate your sinus membrane and graft bone to the sinus floor. This will create a more receptive foundation for dental implants. Ridge Augmentation – If you have lost the uniform shape of your jawbone because of injury, defects, or periodontal disease, this type of grafting will restore cosmetic value to the area. Nerve Repositioning – In some cases, the placement of dental implants may require your inferior alveolar nerve to be relocated. We will perform grafting in order to ensure that you continue to experience sensation in your lip and lower chin. Dr. Bakhtyari and Dr. Prokopets want to reassure you that this procedure is highly successful and very simple. In fact, most patients need no more than local anesthetic to feel comfortable throughout the process. If you have any questions or concerns, please let us know.